Dr. Semparuthi is one of the popular physicians practising at Madurai. He has presented many papers in seminars. He has twelve years experience in practice. 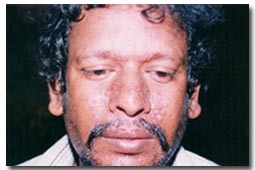 Here he has presented a case of facial dermatitis with evidence based documents. Mr. M, a 45 years old male consulted me for his skin complaints. Had taken various allopathic treatment with Anti fungal and steroids, Recurrence was inevitable. Head pain since 10 yrs once or twice a month, Bi temporal, throbbing,with vomiting and drenching sweat during pain, especially over Face and Chest. From 67 kg - now 53 kg past 10 yrs. Mr. M is from middle class family earning around Rs. 3000/- per month. 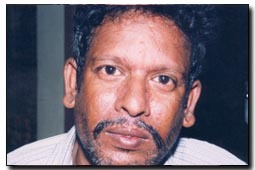 He had the accent of Tirupur Tamil, so he was enquired regarding that. Patient explained that he worked in Tirupur 10 years back. He shifted to Madurai since the handloom business was dull over there. I was surprised to note this statement. On further investigation he started weeping, and then the whole problem, was revealed by him. In a nutshell, he had a happy married life for 14 years with wife and a daughter. One morning wife eloped and no reason could be found. So far, he had been very much hardworking to lead a decent life; since he had received criticism and insults from neighbours and friends; this had humiliated the patient. This is the time he was forced to shift from Tirupur to Madurai. He has never revealed this problem to anyone else in Madurai. The suppression has led to all the ailments like skin eruptions, head ache and sleep disturbance. Treatment was continued for 6 months with Sac lac twice a day. No recurrence.